The Drosophila genes wingless (wg) and decapentaplegic (dpp) comprise the top level of a hierarchical gene cascade involved in proximal-distal (PD) patterning of the legs. It remains unclear, whether this cascade is common to the appendages of all arthropods. Here, wg and dpp are studied in the millipede Glomeris marginata, a representative of the Myriapoda. Glomeris wg (Gm-wg) is expressed along the ventral side of the appendages compatible with functioning during the patterning of both the PD and dorsal-ventral (DV) axes. Gm-wg may also be involved in sensory organ formation in the gnathal appendages by inducing the expression of Distal-less (Dll) and H15 in the organ primordia. Expression of Glomeris dpp (Gm-dpp) is found at the tip of the trunk legs as well as weakly along the dorsal side of the legs in early stages. Taking data from other arthropods into account, these results may be interpreted in favor of a conserved mode of WG/DPP signaling. Apart from the main PD axis, many arthropod appendages have additional branches (e.g. endites). It is debated whether these extra branches develop their PD axis via the same mechanism as the main PD axis, or whether branch-specific mechanisms exist. Gene expression in possible endite homologs in Glomeris argues for the latter alternative. All available data argue in favor of a conserved role of WG/DPP morphogen gradients in guiding the development of the main PD axis. Additional branches in multibranched (multiramous) appendage types apparently do not utilize the WG/DPP signaling system for their PD development. This further supports recent work on crustaceans and insects, that lead to similar conclusions. The genes wingless (wg) and decapentaplegic (dpp) are important factors for the normal development of the Drosophila legs. Both genes encode secreted morphogens that generate combinatorial gradients across the developing imaginal leg discs (e.g. ). These gradients form the top level in a PD axis patterning cascade and they control expression of the genes at the next level of the cascade, the leg-gap genes (e.g. Distal-less (Dll), dachshund (dac)) (e.g. [2, 3]). Thus, wg and dpp are key factors involved in the early events of PD axis formation. In recent years several comparative studies in other arthropod species have suggested that the action of the leg-gap genes in PD patterning is evolutionarily conserved [4–9]. Tus, the question arose as to whether the regulation of the leg-gap genes by the WG/DPP morphogen gradient is also conserved. The currently available data provide no clear answer. Initially, the expression patterns did not support the conservation of this top level of the PD axis patterning cascade [9, 10]. Other authors, however, have argued in favor of a conservation of WG/DPP morphogen signaling in PD axis formation . Furthermore, many arthropods have appendages with more than one PD axis. It is currently debated whether these multiple axes are all patterned by a cascade involving wg and dpp at the top level, or whether the different branches are patterned through branch-specific mechanisms. The comparative analyses of wg and dpp expression during appendage formation to date mainly focus on insects (e.g. Tribolium, Gryllus, Schistocerca, Athalia [9–12]). Only a few representatives of the crustaceans and chelicerates have been studied from other arthropod classes [6, 13]. Here, I report on results concerning wg and dpp expression in the appendages of a representative of the fourth extant arthropod class, the myriapod Glomeris marginata. The wg gene of Glomeris is expressed on the ventral side of the appendages compatible with a conserved role in PD axis development. Additionally, Glomeris wg may induce expression of the genes Dll and H15 in the sensory organs of the mouthparts. The results with the Glomeris dpp gene are more ambiguous. Although the data can be interpreted in favor of a conservation of the WG/DPP morphogen gradients, clearly more work on the subject is necessary to clarify the evolution of PD axis patterning in arthropod appendages. In particular, it will be necessary to elucidate the mechanisms through which the additional PD axes in multibranched appendages are patterned. A fragment of a Glomeris gene that shows sequence similarity to members of the TGF-beta gene family was isolated. In order to establish the orthology of this fragment, I performed a phylogenetic analysis incorporating a selection of TGF-beta proteins from Drosophila, other arthropods and a variety of deuterostome taxa. The resulting phylogenetic tree distinguishes two groups of proteins. One group comprises the arthropod dpp genes and their deuterostome homologs, the BMP2/4 genes. The second group consists of the Drosophila TGF-beta genes screw (scw) and glass bottom boat (gbb), and the remaining deuterostome BMP genes with TGF-beta homology, including zebrafish anti dorsalizing morphogenetic protein (ADMP). The Glomeris fragment resides in the dpp/BMP2/4 group and is therefore designated as Gm-dpp (Fig. 1). The resolution within the dpp/BMP2/4 group is low, with many nodes lacking statistical support. The Glomeris fragment forms a group together with dpp from the two-spotted cricket (Gryllus bimaculatus) and BMP2/4 from the yellow acorn worm (Ptychodera flava). However, support for this grouping is not statistically significant (reliability value = 27). A higher resolution of the dpp/BMP2/4 group may be achieved in the future by the aquisition of additional sequence information. Phylogenetic analysis of the Glomeris dpp fragment. The analysis included TGF-beta genes from mouse (Mm), zebrafish (Dr), lancet (Branchiostoma floridae; Bf), acorn worm (Ptychodera flava; Pf), the sea urchins Strongylocentrotus purpuratus (Sp) and Lytechinus variegatus (Lv), fruit fly (Dm), flour beetle (Tribolium castaneum; Tc), sawfly (Athalia rosae; Ar), buckeye butterfly (Junonia coenia; Jc), the grasshoppers Schistocerca americana (Sa) and S. gregaria (Sg), cricket (Gryllus bimaculatus; Gb), pill millipede (Glomeris marginata; Gm), and the spiders Achaearanea tepidariorum (At) and Cupiennius salei (Cs). Shown is the unrooted Puzzle tree computed from 1000 intermediate trees produced with the Quartet Puzzling method . The numbers at the edges denote the reliability values. 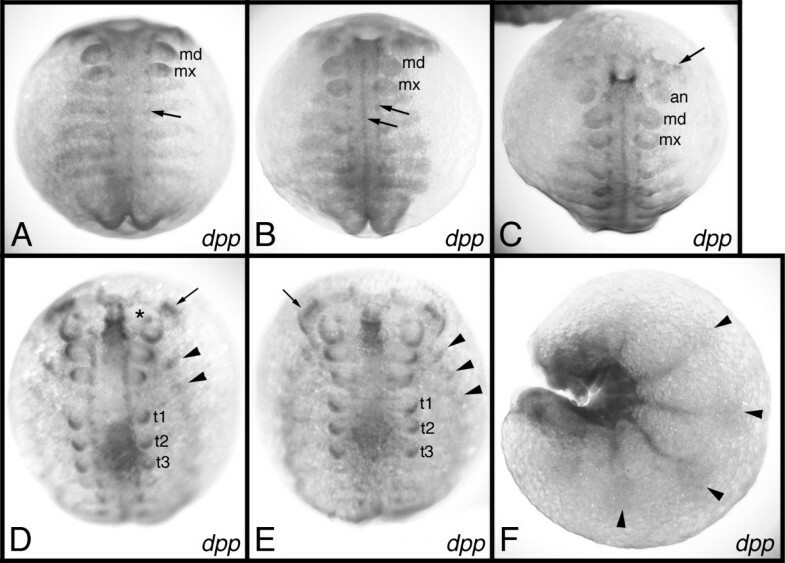 The expression of a number of developmental genes has been studied in the pill millipede Glomeris marginata [7, 14–17]. Of all genes studied so far the expression of Gm-dpp is the weakest. A specific in situ hybridization signal is observed after approximately six hours of staining, whereas the normal staining interval of other genes ranges between 15 and 30 minutes. This extended staining time is responsible for the intense artificial background that is visible in the preparations displayed in this paper (see Figs. 2, 3). Expression of Gm-dpp in G. marginata embryos. (A) stage 2. The arrow points to expression in the dorsal portion of the neuroectoderm. (B) stage 3. The arrows point to the dorsal and ventral (middle) portion of the neuroectoderm, respectively. (C) stage 3. Aspect of the head. The arrow points to expression in the brain. (D) stage 4. Arrow: expression in the optic lobe. Asterisk: expression in the antennal neuromere. Arrowheads: expression in the heart. (E) stage 5. Arrow: expression in the optic lobe. Arrowheads: expression in the heart. (F) stage 6.1. The arrowheads denote expression in the dorsal portion of the germ band that is probably correlated with heart formation. A-E are in ventral aspect. F is in lateral aspect. Abbreviations: md, mandible; mx, maxilla; an, antenna; t1, t2, t3, first three trunk legs. Expression of Gm-dpp during appendage development. (A, E, I) trunk legs. (B, F, J) maxilla. (C, G, K) mandible. (D, H, L) antenna). The arrows in A, E, I, D, H, L point to the distal expression domain in the trunk legs and the antenna, and denote the border of this domain against the ventral side of the appendage, where no Gm-dpp expression is detected. The arrows in B, F, G, K point to a ventral expression domain in the gnathal appendages. In all panels arrowheads denote expression along the dorsal side. The asterisk in K denotes expression in the external lobe. The asterisk in D denotes expression in the antennal neuromere at the base of the antenna. The asterisk in L denotes expression within the base of the antenna. The square in L is located next to a weak ring of expression in the antenna. Stages are as indicated in the top right corner the panels. Abbreviations: max, maxilla; mdb, mandible; ant, antenna. In younger stages, a specific staining is seen in the forming appendage buds and along the external, i.e. dorsal, rim of the neuroectoderm (Fig. 2A; arrow). It is known that the neuroectoderm of each hemisegment is divided into a dorsal, medial and ventral portion . Judging from its expression, it is possible that Gm-dpp has a role in the development of the dorsal portion of the neuroectoderm. A role in the developing ventral portion is also possible, since Gm-dpp is transiently expressed along the ventral midline (Fig. 2B; arrows). A further expression domain in the central nervous system is seen in the area of the developing optic centers of the brain (Fig. 2C,2D,2E; arrows). Starting with stage 4, Gm-dpp is expressed along the external rim of the germband in tissue that will later form the heart (Fig. 2D,2E; arrowheads). Later on, segmentally repeated patches of weak Gm-dpp expression appear on the dorsal side of the embryos (Fig. 2F; arrowheads). These patches are presumably also correlated with the developing heart of the embryos. 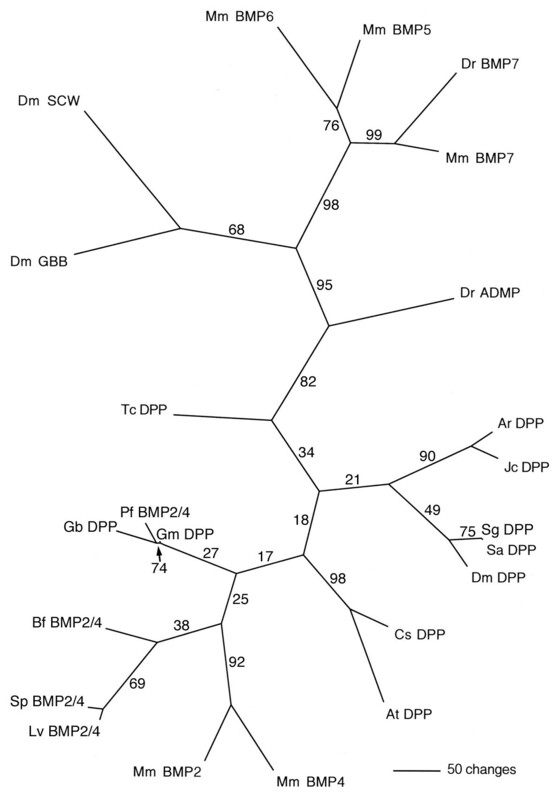 Finally, expression of Gm-dpp is found in the stomodaeum, and very weakly in the proctodaeum. The appendages buds show weak expression of Gm-dpp at the very beginning of their formation (Fig. 2A,2B). Later on, different appendages display appendage-specific expression patterns. In the trunk legs, the strongest expression is seen at the leg tips. In early developmental stages the expression fills almost the entire tip, and the border against the ventral portion of the legs (which is devoid of expression) is rather distinct (Fig. 3A). There is also expression of Gm-dpp along the dorsal side of the trunk legs, but this is visibly weaker than the expression in the leg tips. The expression at the leg tips is clearly confined to the dorsal side of the tip in legs of stage 5 embryos (Fig. 3E), while the expression along the dorsal side persists, but becomes weaker and diffuse. Finally, expression of Gm-dpp in the legs vanishes almost completely at stage 6 (Fig. 3I). The dorsal expression is virtually undetectable, and only a few cells express Gm-dpp at the tip. 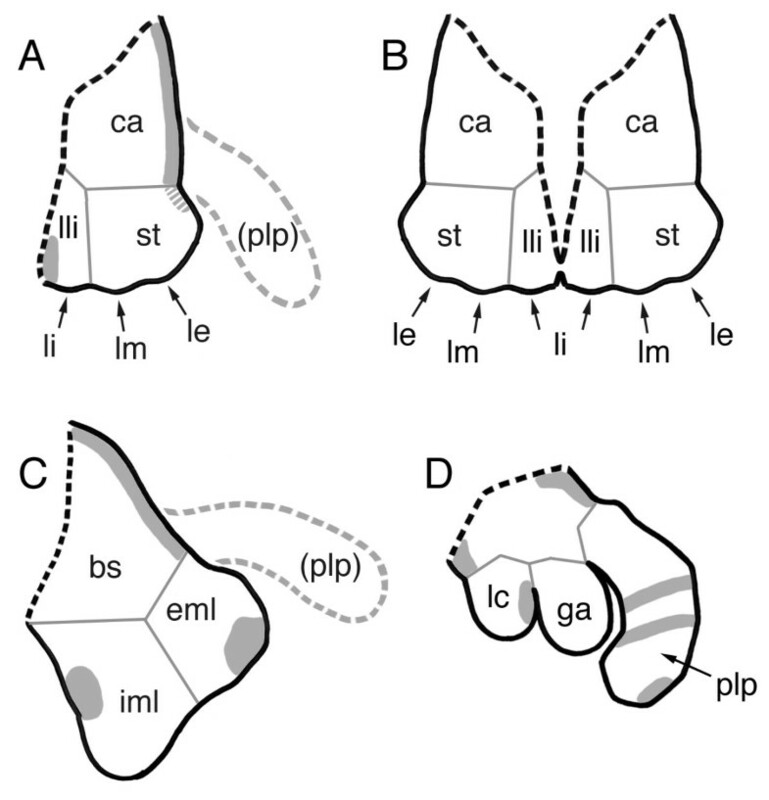 In the maxilla there are two expression domains of Gm-dpp, a dorsal and a ventral one (Fig. 3B). The ventral domain is located on the internal side at the base of the maxilla. This domain slowly vanishes during development (Fig. 3F) and finally disappears around stage 6 (Fig. 3J). The dorsal expression domain runs along the dorsal edge of the base of the maxilla (Fig. 3B,3F). This domain also gradually disappears during development, and at stage 6.1 only a faint dorsal expression is detectable (Fig. 3J). In the mandible, a dorsal expression domain that runs along the entire dorsal rim of the appendage is visible (Fig. 3C). Later on, however, this expression is restricted to the basal portion of the mandible and has a distinct border against the external lobe (Fig. 3G). Additional expression domains are detectable at later stages within the external lobe (Fig. 3K; asterisk) in addition to the internal side of the internal lobe (Fig. 3G,3K; arrow). In the antenna, Gm-dpp is expressed in the dorsal half of the appendage with a distinct border against the non-expressing ventral half (Fig. 3D). In addition, a patch of weaker Gm-dpp expression is located on the ventral side of the antenna (Fig. 3D; square). Another patch of Gm-dpp expression is visible at the transition between the antennal base and the neuroectoderm of the antennal neuromere (Fig. 3D; asterisk). The latter two patches of expression disappear during the further course of development. By stage 5 the ventral spot has disappeared completely, and the patch at the antennal base is virtually gone as well (Fig. 3H). Similar to the other appendages at stage 6.1, the level of Gm-dpp expression has also significantly decreased, though one can discern three specific expression domains at this stage. There are two groups of cells (at the tip and at the base of the antenna) weakly expressing Gm-dpp (Fig. 3L; arrow and asterisk, respectively), and a ring of cells at the distal third of the antenna, where Gm-dpp expression is even weaker (Fig. 3L; square). The expression of Gm-wg during germ band segmentation, neurogenesis, and the development of the digestive system has already been described . Here, I focus on Gm-wg expression during the development of the appendages. Before the onset of limb development, Gm-wg is expressed in a stripe in each hemisegment. This stripe is located approximately in the middle of the segment and runs across the neuroectoderm and the presumptive appendage tissue. Comparison to the expression of engrailed (Gm-en) has shown that the stripe of Gm-wg expression abuts the parasegment border and, thus, is located in cells of the anterior segmental compartment . The buds of the appendages form from the tissue at the external ends of the Gm-wg stripes. 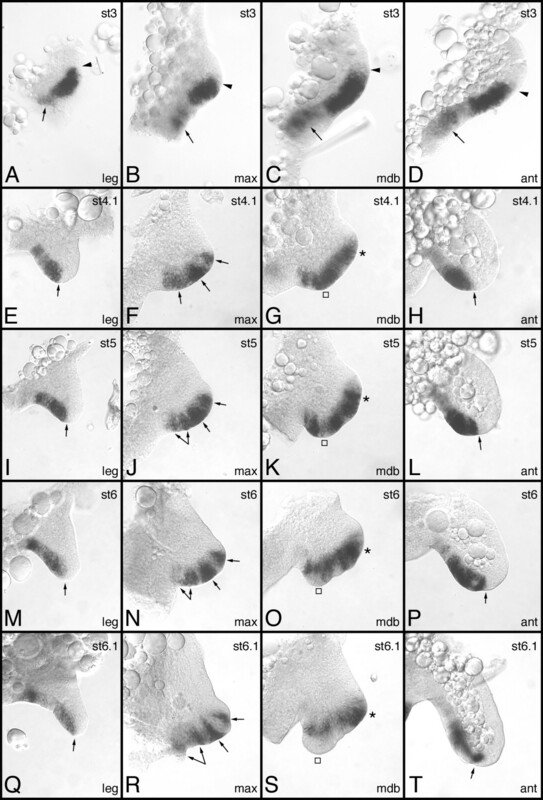 Preparations of complete hemisegments of stage 3 embryos show, that expression of Gm-wg extends more or less contiguously across the neuroectoderm into the forming limb buds in all four different appendage types (Fig. 4A,4B,4C,4D). The extent to which the expression reaches into the limb buds varies depending on the appendage type. In the antennal bud the expression of Gm-wg is restricted to the ventral side (Fig. 4D). In the maxillary and mandibulary buds expression includes larger areas, approximately two thirds of the buds (Fig. 4B,4C). Finally, expression is most extensive in the buds of the trunk legs: almost the entire buds express Gm-wg (Fig. 4A). Expression of Gm-wg during appendage development. (A, E, I, M, Q) trunk leg. (B, F, J, N, R) maxilla. (C, G, K, O, S) mandible. (D, H, L, P, T) antenna. The arrowheads in A-D, and the arrows in E, I, M, Q and H, L, P, T point to the transition of ventral to dorsal tissue in the appendages. The arrows in A-D point to expression in the neuroectoderm of the respective body segment. The arrows in F, J, N, R denote the expression surrounding the maxillary sensory organs. The squares and asterisks in G, K, O, S denote expression of Gm-wg in the internal and external lobe, respectively. Stages are as indicated in the top right corner of the panels. Abbreviations see Fig. 3. In the trunk legs expression of Gm-wg is restricted to the ventral side during the further course of development (Fig. 4E,4I,4M,4Q). The expression is contiguous from the base of the legs to the tips, but the level of expression is somewhat heterogeneous. The strongest expression is seen near the base and in the distal part of the legs, while expression is visibly weaker between these parts. A similar phenomenon is present in the antenna (Fig. 4H,4L,4P,4T), where expression is restricted to the ventral side of the antenna and the level of expression at the distal end is much stronger than in more proximal parts. However, unlike the pattern in the legs, the intensity of expression at the base of the antenna is not increased. The maxilla displays a rather dynamic expression profile of Gm-wg. Beginning at stage 4 the gene is expressed along the ventral edge of the maxilla (Fig. 4F). Three domains can be distinguished that are not completely separated. The innermost domain is more diffuse than the other two domains and at stage 5 separates into two separate patches of expression (Fig. 4J,4N,4R; two-headed arrow). The two other domains remain separate during the development of the maxillary appendage and are reminiscent of the expression pattern of Gm-Dll (see below). In the mandible, a similar fragmentation of the initial mostly homogeneous expression pattern takes place. In the external lobe the expression is strong throughout and is separated from the expression domain in the internal lobe by an area of very weak expression (Fig. 4G,4K,4O,4S). The expression domain in the internal lobe splits (Fig. 4K), then retracts from the tip of the lobe (Fig. 4O) and decreases in expression strength (Fig. 4S). As mentioned above, the expression pattern of Gm-wg in the maxilla is reminiscent of the pattern described for Gm-Dll , and at first glance both patterns appear virtually identical. The Gm-Dll gene is expressed in the primordia of the maxillary sensory organs. Expression of the Gm-wg gene, however, is at least partially complementary to the pattern of Gm-Dll. In older stages, strong expression of Gm-wg is not detected within the primordia of the sensory organs, but rather it surrounds the primordia (Fig. 4R). In preparations simultaneously labeled with probes against Gm-wg and Gm-Dll the composite expression pattern stains the entire internal side of the maxilla (Fig. 5A,5C), indicating that both patterns complement each other. However, the maxillary expression of Gm-wg in three (later four) domains is more extensive than the more restricted expression pattern of Gm-Dll in two (later three) well-defined stripes (see ). Therefore, the expression patterns are certainly not mutually exclusive. The presumed overlap of the two expression patterns, however, cannot be detected with the double labeling technique used here. The relation between the expression of Gm-wg and Gm-Dll. 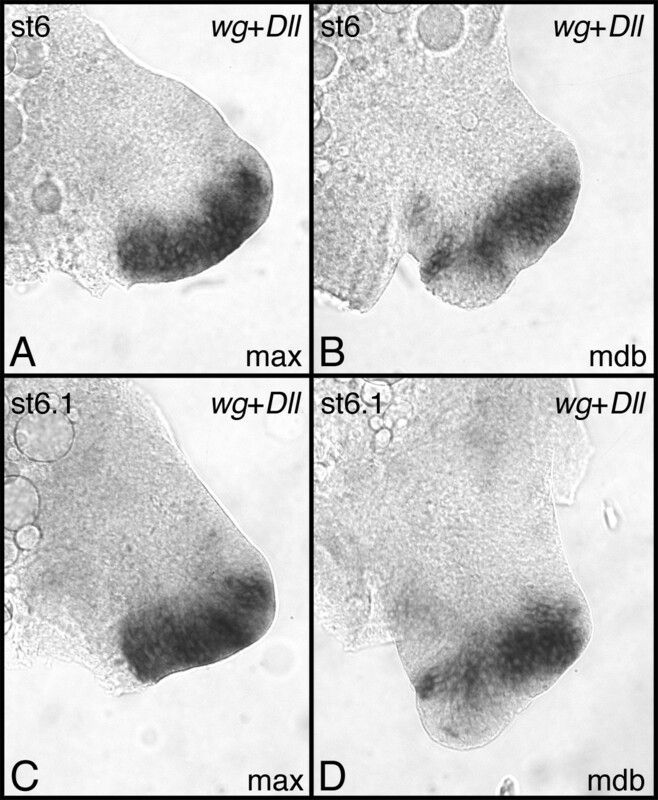 Preparations of maxillae (A, C) and mandibles (B, D) simultaneously labeled with a mixture of probes against Gm-wg and Gm-Dll. In the maxilla the patterns complement each other to stain the entire ventral edge of the appendage, whereas in the mandible no significant difference is observed compared to Gm-wg expression detected alone. Compare to Fig. 4. Stages are as indicated in the top left corner of the panels. Abbreviations see Fig. 3. In addition, a complex and dynamic pattern of Gm-Dll has been described in the mandible . In contrast to the maxilla, the patterns of Gm-wg and Gm-Dll appear to overlap completely in the mandible. In preparations of mandibles labeled with a cocktail of probes against both genes no significant difference to the pattern of Gm-wg alone is observed (Fig. 5B,5D), indicating that the Gm-Dll pattern is entirely included in the Gm-wg pattern. In Drosophila dpp is expressed in a narrow dorsal sector in the leg imaginal discs, whereas wg is expressed in a similar sector on the ventral side (e.g. ). Together these two genes generate morphogen gradients in the developing leg imaginal discs. These gradients are utilized by several genes to guide the development of the PD axis of the leg imaginal discs. Evolutionary developmental studies have shown that the expression of wg homologs along the ventral side of the appendages is highly conserved in the arthropods (e.g. [6, 9, 10, 13]). In contrast, dpp expression differs from the expression pattern found in Drosophila in all arthropods studied thus far (e.g. [6, 9–12, 18, 19]). At early stages expression of arthropod dpp homologs is restricted to the leg tip, while at later stages expression rings of unclear significance appear in some species. Despite these differences in expression, it has been argued that the combined action of the WG and DPP morphogen gradients is conserved, and that the differences in expression of dpp are correlated with the differences in the mode of leg development between Drosophila (via imaginal discs) and most other arthropods (normal leg outgrowth) . The data from Glomeris presented here may be interpreted in favor of this hypothesis. The Gm-wg gene is expressed along the ventral side in the legs and Gm-dpp is expressed most strongly in the leg tips. Taking these expression loci as the sources of Gm-WG and Gm-DPP protein, the resulting hypothetical protein gradients would facilitate PD patterning events similar to the ones in the Drosophila leg discs (see also Fig. 11 in ). However, Gm-dpp is weakly expressed along the dorsal leg side. This is similar to the Drosophila situation, but is contrary to the predictions of the above hypothesis since Glomeris does not develop the legs via flat imaginal discs and therefore should show a dpp expression pattern typical of directly developing legs rather than a pattern similar to Drosophila. The fact that Gm-dpp is also weakly expressed along the dorsal side of the legs may be explained by several possibilities. It may be argued that the dorsal expression is so weak that it has no significant influence on the shape of the Gm-DPP protein gradient, which would therefore mainly be dependent on the morphogen source at the tip. It is also possible that the dorsal expression is unrelated to PD axis formation and instead functions during DV axis formation (see below). In any case, the picture emerging from the available data on dpp expression in arthropods is that the dorsal sector in Drosophila seems to be an exception rather than the rule. The hypothesis proposed by Prpic et al. attempts to explain this by the differences in leg architecture between Drosophila and most other arthropod species. However, according to their hypothesis, the presence of combinatorial protein gradients is conserved. It should be pointed out in this context that the existence of a DPP gradient (or a WG gradient for that matter) has yet to be demonstrated in an arthropod other than Drosophila. Thus, although the expression data may be interpreted as the PD axis patterning using WG/DPP signaling being conserved among arthropods, it is obvious that comparative expression analyses alone cannot answer the question satisfactorily. It must now be considered whether experiments capable of demonstrating WG/DPP signaling during leg development in arthropods other than Drosophila may be conceived. Aside from the primary PD axis, many arthropods have limbs with additional branches (rami). It has been proposed that these additional rami are patterned in the same way as the main branch, simply by duplications of the WG/DPP signaling system . Recent results from the study of insect mouthparts argue against this notion . The insect labium and maxilla have ventral branches (endites) that apparently do not utilize a combinatorial WG/DPP gradient system to guide their outgrowth. A similar conclusion has been reached by a study of the development of crustacean multibranched appendages . The presence of endites in the mouthparts of myriapods is unclear, mainly because of the modified morphology of the adult gnathalia. Certain elements of the centipede mandible and first maxilla are probably derived from endites (e.g. [21, 22]) and there are attempts to assign parts of the diplopod mandible as homologous to crustacean or insect endites (e.g. [21, 23]). Indeed, the embryonic mandible and maxilla in Glomeris develop ventral lobes that are very reminiscent of the endite lobes of the embryonic mouthparts in insects. The exclusive ventral origin of these lobes is further corroborated by the lack of expression of the dorsal marker optomotor-blind . Furthermore, the Glomeris lobes possess Dll-positive sensory organs, which is typical of arthropod endites [7, 24–26]. Thus, although the interpretation of the millipede mouthparts is disputed (see e.g. ), these ventral lobes are likely homologous to the endites present in insect mouthparts. The embryonic Glomeris mandible develops two lobes, the internal and external mandibular lobe. Both lobes express Gm-dpp, but not at a position suggestive of a role in PD axis formation (Fig. 6C). In addition, the expression domain in the external mandibular lobe appears after the lobe has already grown and is therefore unlikely to be involved in PD outgrowth. The development of the maxillae is more complex. They start out as separate appendages, but around stage 6 the left and the right maxilla fuse along their internal sides (Fig. 6A,6B). Each maxilla has a single lobe, containing the primordia of three sensory organs that can also be visualized by Gm-Dll expression . The two external sensory organ primordia form the lobus medius and the lobus exterior in the adult (see  for a detailed description of Glomeris maxillary morphology). These two sensory structures grow from the internal side of the stipes (Fig. 6A). The internal sensory organ primordium is different from the other two in the sense that it will not end up on the stipes, but will form the lobus interior that grows from the lamella lingualis (Fig. 6A). The lamellae linguales of the right and left maxilla fuse around stage 6 to form the intermaxillary plate (Fig. 6B). The single lobe in the Glomeris embryonic maxilla therefore has a rather complex fate in the adult mouthpart (the gnathochilarium ). The portion of the maxillary lobe that will give rise to the stipes expresses Gm-dpp at only later stages when the expression along the dorsal side of the maxillary base is extending weakly into the stipes. The portion forming the lamella lingualis also expresses Gm-dpp, but at its internal edge, a location hardly suggesting a role in PD outgrowth of the maxillary lobe. Possible endite homologs in the mouthparts of Glomeris. Schematic representations of the mouthparts of Glomeris (A-C). An insect mouthpart (maxilla of Schistocerca) is shown for comparison (D). (A) Glomeris maxilla. (B) Left and right maxilla of Glomeris already fused forming the gnathochilarium. (C) Glomeris mandible. The palp is proposed to be lost in Glomeris gnathalia (; grey hatched line). The black hatched line indicates where the appendage inserts on the segment. Expression of dpp is shown in grey (hatched area in the maxilla: very weak expression). Please note that the figure shows all observed expression domains in a single drawing although really some domains appear at different time points (see text for a description of the temporal expression profile). None of the possible endite homologs in Glomeris mouthparts (lli, st, iml, and eml) expresses Gm-dpp in a fashion suggestive of a role in PD axis patterning. See text for details. Expression of dpp in Schistocerca is after . Abbreviations: bs, base; ca, cardo; eml, external mandibular lobe; ga, galea; iml, internal mandibular lobe; lc, lacinia; le, lobus exterior; li, lobus interior; lli, lamella lingualis; lm, lobus medius; plp, palp; st, stipes. In summary, none of the maxillary and mandibulary lobes in Glomeris appear to utilize conventional WG/DPP signaling to organize PD growth. Similar results have been obtained recently for the endites in the grasshopper Schistocerca and the beetle Tribolium . In Schistocerca at least one endite (the galea) grows without dpp expression (Fig. 6D), and in Tribolium both maxillary endites lack detectable dpp expression . This indicates that the development of the PD axis of the endites does not generally require the WG/DPP morphogen system. A second role of wg and dpp in Drosophila is the activation of some factors involved in DV axis formation in the legs [28, 29]. wg, being expressed along the ventral side, is an instructor of ventral fate, whereas dpp is expressed on the dorsal side and establishes dorsal fates. The primary factors controlled by wg and dpp are H15 on the ventral side and omb on the dorsal side. These factors have been recently studied in Glomeris and in a spider (Cupiennius salei) [6, 17]. The expression patterns suggest that the role of omb as dorsal instructor is evolutionarily conserved, but H15 does not seem to be a general ventralizing factor in all arthropods. Thus, the dorsal, but not the ventral developmental mechanisms seem to be conserved. It is interesting that the expression data of wg and dpp suggest that the opposite is true. The wg expression on the ventral side is highly conserved among the arthropods, but the dpp patterns differ between species and in most part expression is not localized to the entire dorsal side. This paradox clearly demonstrates the limited understanding of the evolution of DV axis formation in arthropod appendages. The maxilla of Glomeris has several sensory organs. Recent studies have identified the genes Dll, dac and H15, which show a restricted expression pattern in the primordia of the maxillary sensory organs [7, 17]. Two of these genes, Dll and H15, are known from Drosophila to be activated upon signaling through the wingless pathway [29, 30]. It is interesting to note that expression of Gm-wg surrounds the sensory primordia in the Glomeris maxilla. It may therefore be the case that cells expressing Gm-wg in the surrounding of the primordia signal to their neighbors within the primordia and stimulate them to activate Gm-Dll and Gm-H15. Minimally the activation of Dll appears to be a general feature of appendicular sensory organs in arthropods since Dll expression has been observed in appendicular sensory organs in chelicerates, crustaceans, myriapods and insects (e.g. [7, 24, 25, 31]). Moreover, data from Drosophila suggest that Dll expression is critically required for sensory organ formation, as mutants lacking Dll fail to develop Keilin's organs (the sensory structures of the embryonic leg anlagen) [32, 33]. The expression of Gm-wg and Gm-dpp during appendage development indicates a role for both genes in guiding this process. Involvement of wg and dpp in appendage development appears to be conserved among all extant arthropod classes including myriapods. 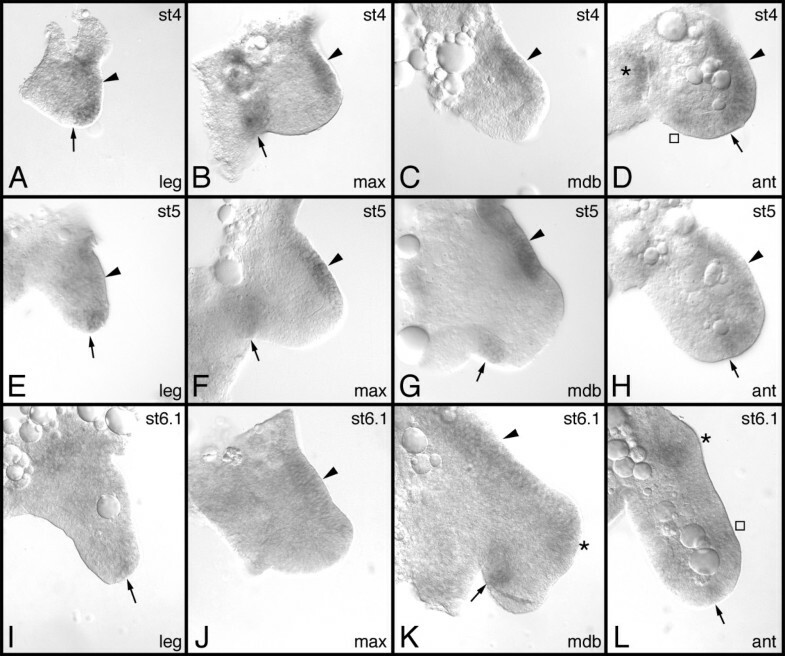 The data from Glomeris and other arthropods suggest that the WG/DPP morphogen signaling system as it is known from Drosophila leg discs is present in all arthropods. However, this morphogen system apparently functions in only the main branch of the appendages, the so-called telopodite . Limb types with additional branches (e.g. endites) obviously use additional, yet unidentified mechanisms to organize proximal-distal growth of the extra branches. Gene expression in potential endite homologs present in Glomeris mouthparts supports this notion. Aside from the role in PD axis formation, the expression profile of Gm-wg suggests an additional role for this gene in patterning appendicular sensory organs. Animals were collected during Spring 2003 in beech forests in the vicinity of Cologne, Germany and near Kranenburg, Germany. They have been treated as described before [6, 14]. The animals were released after the end of the breeding season (Summer '03). The cloning assays were based on cDNA transcribed from polyA-RNA extracted from selected Glomeris embryos of all developmental stages up to stage 6.1 (see [14, 35] for a description of embryonic stages) and were performed in duplicate. For the amplification of dpp-like gene fragments, the primers dpp-fw-1 (GAY GTN GGN TGG GAY GAY TGG) and dpp-bw-1 (CKR CAN CCR CAN CCN CAN AC) were used in the initial PCR, and the primers dpp-fw-2 (GGN TAY GAY GCN TAY TAY TG) and dpp-bw-1 were used in the nested PCR. Additional sequence information was gained by RACE PCR. No full-length fragment could be obtained and several artificial clones were encountered, probably representing chimeric products resulting from jumping PCR between different TGF-beta-like cDNAs. Using species specific primers, artificial and genuine fragments were identified. A confirmed genuine fragment of almost 360 bp was isolated and cloned. This fragment was used for sequence analysis and probe synthesis. The isolation of Gm-wg has been previously reported . The GenBank accession numbers are as follows: Gm-wg (AJ616907); Gm-dpp (AJ843875). Pairwise alignments of aminoacid sequences were performed by searching GenBank  using the Gapped BLAST program . The alignments were calculated based on the BLOSUM 62 matrix  (gap costs: 11 for opening, 1 for extension). Multiple sequence alignments were calculated based on the GONNET matrix  (gap costs: 10 for opening, 0.2 for extension) implemented in CLUSTAL_X . The resulting alignments were subjected to maximum likelihood analysis using the Quartet Puzzling method  as implemented in PAUP* 4.0b10 . In situ hybridization with digoxigenin-labeled RNA probes has been performed as previously described . Whole-mount embryos were photographed in PBST under a Leica dissection microscope. Appendages were dissected with fine insect needles and photographed in 50% glycerol under a Zeiss Axioplan microscope. All images were corrected for color values, brightness and contrast using Adobe Photoshop 5.5 for Apple Macintosh. The image processing software has also been used to enhance image backgrounds by retouching dirt or yolk remains, and to group together single pictures into multipanel figures. I thank Diethard Tautz for his encouragement and advice during all phases of my work. The clone of Gm-wg has been a gift from Ralf Janssen. The Glomeris RACE template has been a gift from Hilary Dove. I also thank Wim Damen for comments on the manuscript. I thank John Baines for his help with the English language. This work has been funded by a grant from the Deutsche Forschungsgemeinschaft (grant number TA99/19-2).